Ocean Nutrition’s three new frozen fish foods. Just when you thought your fish had everything Ocean Nutrition™ introduces three unique, high-quality frozen foods for aquarium fish and invertebrates. Varying in size between 8 and 14 cm, polychaetes (sea worms) are an important food source for larger marine predators. 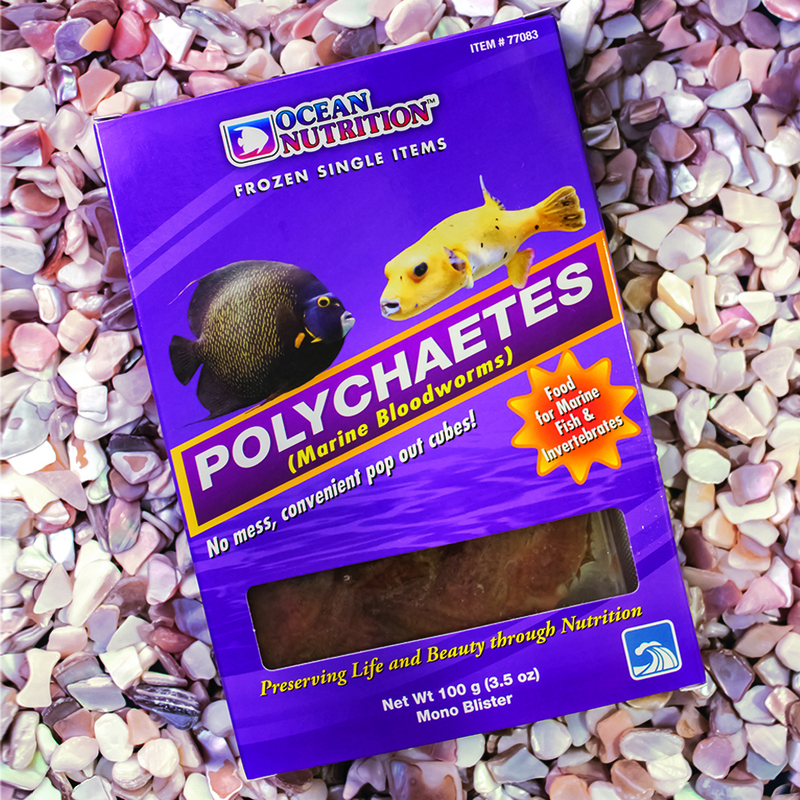 They can be cut easily into smaller pieces, making this soft and nutritious food also available for many smaller fish and invertebrates! Originating from marine water, they are very rich in highly unsaturated fatty acids (ARA, EPA & DHA). Polychaetes are well known to increase fecundity of shrimp and marine fish broodstock. After defrosting, it is advised to rinse well with water to avoid unnecessary contamination of the aquarium water. Excellent for marine fish and invertebrates including: Angels, Butterflies, Groupers, Lionfish, Puffers, Sharks, Triggers, Wrasses, Lobsters, Shrimp, Crabs, and more. 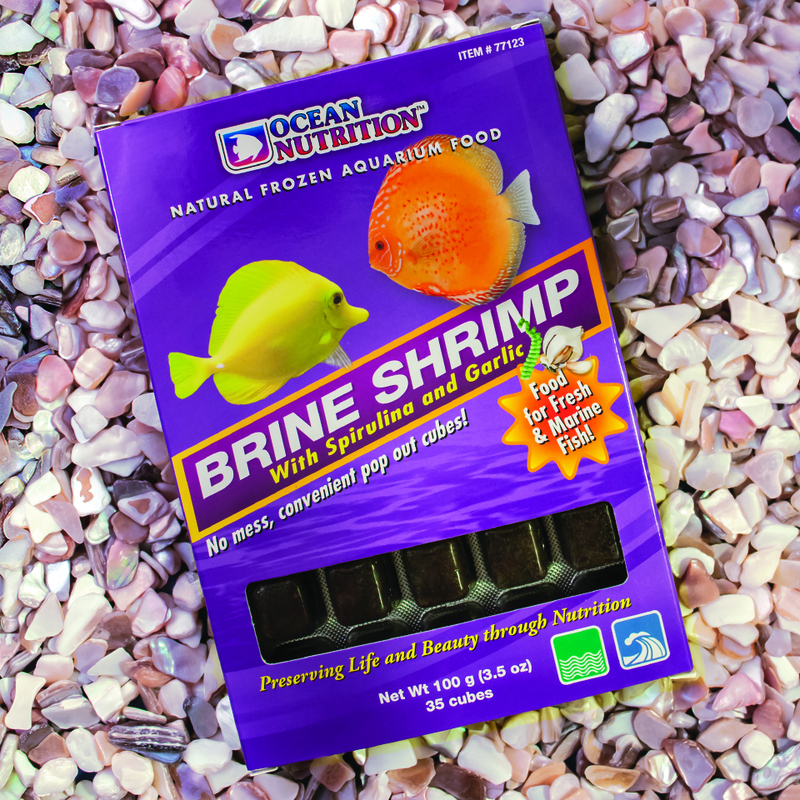 Ocean Nutrition’s Spirulina & Garlic frozen adult brine shrimp. Excellent for all fish including: Discus, Platys, Angels, Tetras, Barbs, Catfish, Swords, Mollies, Gouramis, Rainbows, Freshwater Sharks, Marine Angels, Clownfish, Tangs, Wrasses, Butterflies, Gobies, and more. Ingredients: Brine shrimp, spirulina, garlic, water, guar gum. 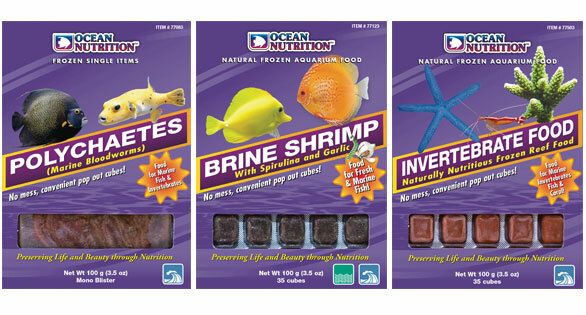 Ocean Nutrition’s new frozen invertebrate food. Ocean Nutrition™ Invertebrate Food Is a blend of finely minced mussel with cyclops and rotifers, prepared to give the most natural and effective diet for filter feeding invertebrates such as flame scallops, feather dusters, sea apples and corals. Mussels are an excellent source of selenium, vitamin B12 and are naturally enriched with phytoplankton. 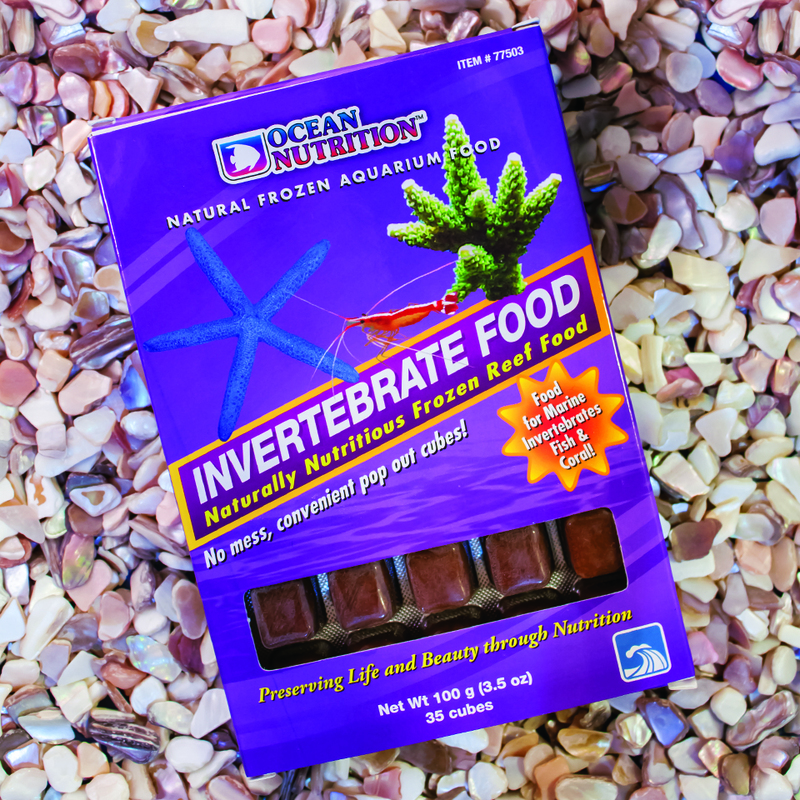 Ocean Nutrition™ Invertebrate Food is ideal for all marine filter-feeding organisms. Excellent for marine invertebrates, corals and small marine fish including: Flame Scallops, Feather Dusters, Shrimp, Crabs, Soft Corals, LPS Corals, SPS Corals, Mandarins, Pygmy Angels, Clownfish, Wrasses, Gobies, Nano Reefs, and more. Ingredients: Cyclops, rotifer, mussel, water, guar gum. Ocean Nutrition™ is the daily choice for fish nutrition and simply the most delicious, nutrient-rich, frozen fish foods found above sea level. Learn more at www.oceannutrition.com.